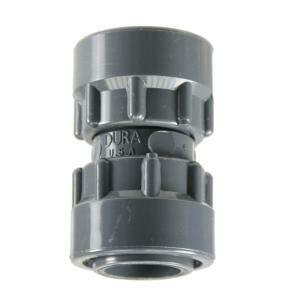 This Gray Schedule 40 PVC 1" FPT Swivel x 1" FPT Swivel Coupler is used with Dura manifold systems. Fittings have nitril rubber O-rings so no pipe dope or teflon tape is needed. Assemble valves without gluing for an easy to repair/replace valve manifold system. Hand tighten only.